One thing I love about traveling is seeing places I’ve long heard about and never expected to see. But in my annual bucket list of travels, I recently found myself walking across the Brooklyn Bridge on a warm fall afternoon. It was crowded, but nobody offered to sell it. There was a wedding on the pedestrian path. A worker cut off locks on a pole by a sign saying $100 fine for locks. Bikes whizzed by on the left and traffic underneath as we slowly walked slightly uphill after starting from the Manhattan side. By midpoint, the Brooklyn and Manhattan skylines rose around us. After 40 minutes of steady walking, we were on a Brooklyn pier staring at the big buildings before us like mountains with snowcaps. Instead of walking bad, though, we took the ferry. So now I’ve crossed the Brooklyn Bridge and Brooklyn off my list (along with Harlem later.) Not a bad day and a good workout. Maybe next time I’ll go to Staten Island on the free ferry. 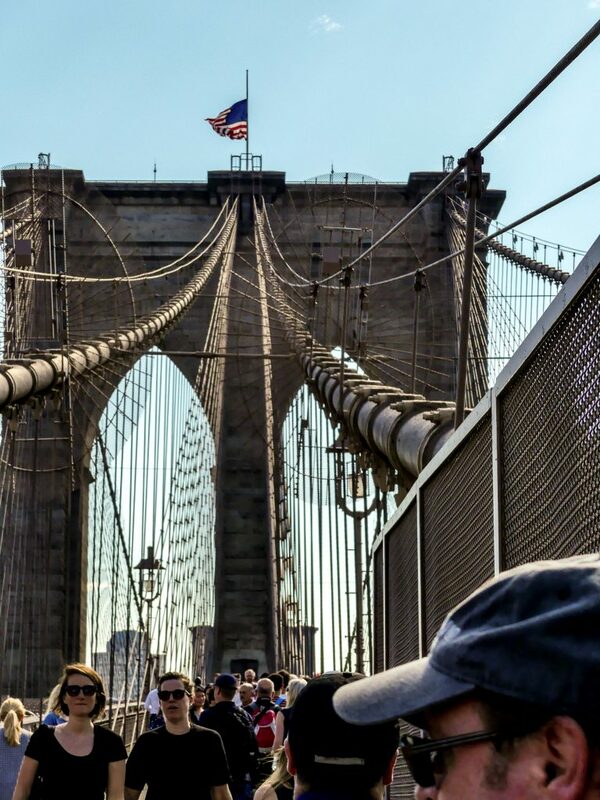 This entry was posted in Attractions and tagged Brooklyn Bridge, Photo by Lisa Snider. Bookmark the permalink.